Ever since Marvel announced Gwen Stacy Spider-Woman as a Spider-Verse character she hass been widely loved. A lot of fan-art, cosplays, and overall appreciation has been widespread on the internet since. With such outstanding popularity she’s was given her very own series and after Secret Wars she’s back! When her first series run came to a close I was disappointed to see we had still too many questions left unanswered. 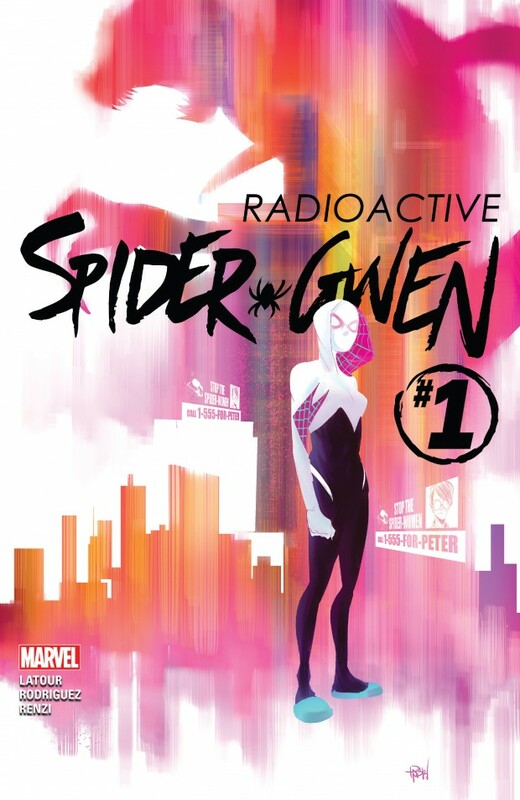 Thankfully, she’s back and quite a few gaps in Spider-Gwen’s story are filled within the first issue. There really isn’t a need to pick up the Secret Wars event stories to read the return of Spider-Gwen as it pretty much continues her story from where it left off. 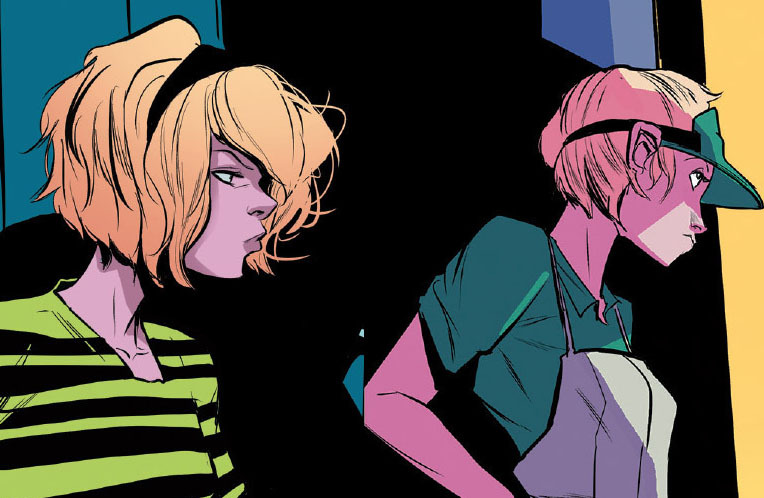 It has yet to resolve any of the conflicts rising in issue #5 of Spider-Gwen but some of the missing pieces to the colorful puzzle of Gwen Stacy’s story in Earth 65 are filled in. The comic starts with Spider-Woman’s nemesis, Bodega Bandit, a criminal who likes to steal corn dogs from “Dollar Dog” and somehow constantly escapes jail despite how many times Spider-Woman throws him behind bars. His robbery of the food joint gets interrupted by a giant Lizard, eating everything inside and taking Bodega Bandit’s dog with it. We now reunite with our favorite hooded blonde webslinger who has clearly made some changes in her life. First off, her hair is even shorter now. It’s an interesting change and to be quite honest I was hoping that the more mature and the more Gwen grows that her hair would grow with it. We see that she’s no longer living at home with her father and that Betty Brant is now her room-mate. The start of Gwen’s adventure is when she wakes up and rushes to her first day of work- late. It’s been a struggle for her to help pay rent even though she’s really trying. She works at the very “Dollar Dog” that was invaded. So much for her first day of work, right? When Gwen hears that her workplace is now ruined by a giant Lizard creature she does goes off to investigate. Bodega Bandit won’t answer her questions about the incident, all she knows is that the Lizard has appeared more than once and takes small pets with it. A key part of this story is that Peter Parker created the Lizard serum that wound up killing him, the very creature that invaded “Dollar Dog”. This is an excellent way to get some answers to questions we’ve had since Marvel announced Spider-Gwen’s debut back in the Spider-Verse event. We get some flashbacks that answer a lot and introduce a couple of ideas. It is revealed that Spider-Woman went after a Midtown High School teacher, Curt Connors agter Peter died. It’s interesting that once again Curt Connors is somehow tied to the Lizard. I’m not sure if I should feel disappointed or enjoy the classic tie in. It felt a little bland compared to other parts of this story that there isn’t much of a change or an original twist like they did with Felicia Hardy back before the series relaunch. Rhino and Vulture weren’t really changed in a refreshing way to me either. You can’t have everything I guess. Let’s not forget that even though Gwen’s Father, Captain Stacy is off the Spider-Woman case he is still determined to work it. He knows it’s his daughter behind the mask and he also knows that she’s innocent. Despite what his partner believes, he is determined to prove that the hooded vigilante is innocent. Even if George Stacy has to turn in his badge to Frank Castle he will do his duty to prove that Spider-Woman is not the killer. It’s a dynamic of the story that’s important, and something I look forward to learning more about. There isn’t a lot to really say on the matter other than it’s an aspect of the story I like and look forward to seeing more of. What I found most intriguing, is seeing Peter and Gwen back in their high school days. I have always wanted to see Gwen’s relationship with Peter since before we knew he died. 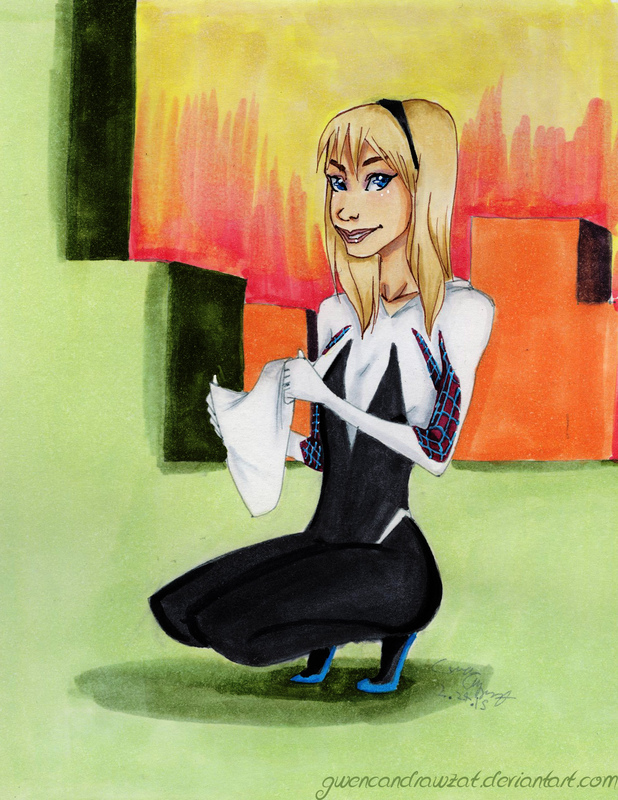 (Back when Spider-Gwen was no more than an announcement). Seeing that they were friends, and neighbors was an interesting revelation that left me wanting more. With more questions answered than this flashback gives. The way the flashbacks only use 2-4 colors to convey that it is the past is quite beautiful. It really gives off the right mood to match Gwen reflecting on the past. We are introduced to a glimpse of Harry Osborn but we don’t see much of him. It is revealed that he has transferred from a ‘Prep School’ with rumors of him trying to burn it down and is already an outcast of the school fitting right in with Gwen and Peter. It’s interesting how this time around that Harry’s ethnicity has been changed. I find that it won’t really affect is character in any positive or negative way. This same concept was applied to Felicia Hardy and it all helps to make Earth-65 a very unique world. Something neat to note is that comics are trying to make more diverse characters with these changes as well as the new Ms. Marvel and the Miles Morales version of Spider-Man to name but a few. 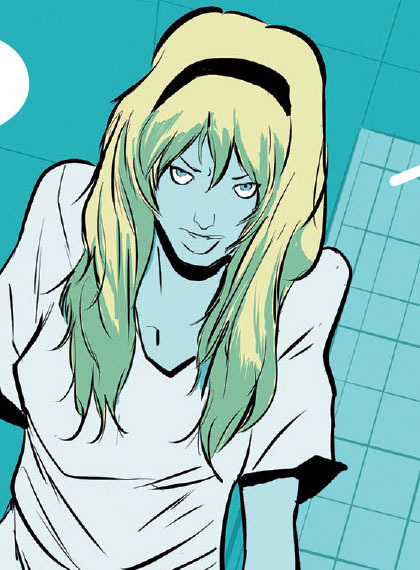 Also something interesting to note, Gwen’s hair was long in High School. It’s interesting how the younger she is the longer the hair. Shorter hair is usually gives off a more youthful feel. As I stated earlier I think that the more she develops as a person her hair would better off to grow longer. Even though I don’t agree with it being the opposite it’s interesting to note. I wonder the reasons for the artistic choices used. Gwen with longer hair in the High School flashback. We see a bit more detail on Peter’s death that it happened when the serum overwhelmed him at prom. A bit cliché that all goes bad at prom if you ask me. (I find prom overall a cliché event, I also never went and I’m perfectly content without such an event in my life). Why couldn’t it have been at graduation as it would be more original, more tragic and a lot more heartbreaking if you ask me. It’s neat to see more details on an event of Gwen’s past that we hear so much about yet know so little about. There is still a lot we have yet to learn. What makes this story so interesting is how refreshingly different it is from other Spider-Man stories. It’s more than a few token diferences between universes. It’s not perfect but the vibrant story holds on its on very well. As always, the first issue comes to a close on an exciting note. Gwen goes down to the sewer to find the giant Lizard. Not only is she greeted by many of the animals around the Lizard attacks that went missing, but also the Lizard. I won’t give away the ending but let’s just say it leaves you wanting more. I look forward to filling in more gaps of this exciting of the story taking place in Earth-65. This was an excellent start for the return of this exciting story. My only disappointment is that we don’t really see any glimpse or even mention of what happened in the last part of the previous Spider-Gwen run. Since it is the same story picking up where they left off so I was hoping for something. The artwork is really well done, it’s absolutely beautiful how crisp and clean the artwork is. The colors are vibrant and really adds to the element of the story. I always find myself admiring the style, whether the faces be beautiful like a Hollywood star at a premier or look as if they just got out of bed. It’s really quite something. I enjoyed seeing how Gwen has been making changes in her life, she’s living away from home with Betty Brant as a room-mate. Even though it’s a struggle to pay rent she does her best. Her job doesn’t seem to work out so far, but it seems that there are now greater problems that lay ahead. Her hunt for the Lizard brought back a lot of darker memories for Gwen, and brings the reader more answers to the death of Peter Parker. It’s a bit cliche how it all had to go wrong at prom and I think graduation would have been more interesting. Once again Curt Connors is tied to the lizard which I found to be a bit more bland compared to other changes to this universe . The flashbacks were something I’ve been wanting for since the character was introduced and they didn’t disappoint. The close of the first issue was quite interesting, we were lead to even more than just the missing pets and the lizard. It’s just too interesting and exciting to give away, it’s something you should discover for yourself. I get the impression we will be getting even more answers in the next issue of Spider-Gwen.